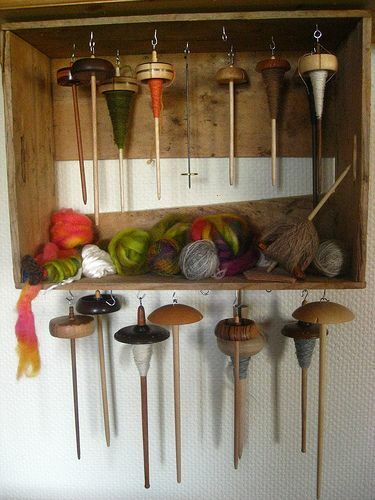 Chances are, you have probably amassed a lot of supplies if you've been spinning, weaving, knitting, hooking, or doing anything crafty for a few years. How do you keep it all organized? 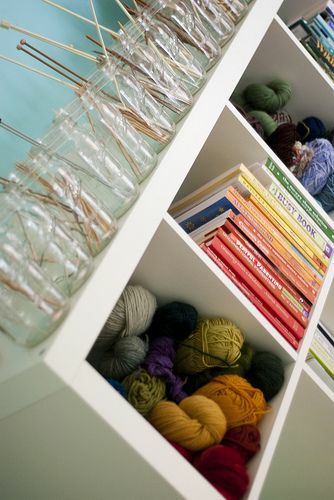 Do you have a dedicated craft corner, or perhaps even an entire room to house your supplies? Just how unwieldy is that fiber or yarn stash? Keeping your fiber supplies organized and easily accessible can serve a number of purposes. It can keep them safe from children, pets, or unwanted pests who could cause damage (if stored properly). It can save you time later on, when you don't have to spend hours searching for that special skein or specific tool that you need to start a new project. Plus, a well-organized craft room or nook just looks lovely! We've collected some of our favorite ideas over on Pinterest to keep your craft supplies, work areas, and WIPs tidy and organized - not to mention, safe from harm! Below are a few of our favorites - click here to see more on Pinterest. 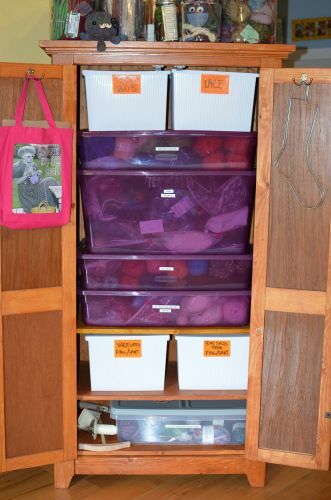 Yarn & Fiber Storage, keeping everything safe in plastic bins - via Must Stash Podcast. Mason Jar Storage for Knitting Needles - via Sew Liberated blog.